Buckland Athletic are promoted to the FA Women’s National League as South West Regional champions, while there are divisional titles for Penrith, South Shields and Woodlands. PREMIER – Brentwood Town beat Royston Town 4-2 in the last game of the campaign, Leah Cowan, Georgia Holdaway, Kirstie Jackson and Chloe Wilkinson all on target. 1 NORTH – Runners-up Kings Lynn Town got the only goal at Histon through Georgia Reardon to complete the fixtures. 1 SOUTH – Champions Stevenage Reserves finished with 4-1 & 1-0 wins over Little Thurrock Dynamos, Daniela Martucci scoring three times overall. Hutton took fourth spot after twice beating Bishops Stortford 4-0 in their double-header. PREMIER – Oughtibridge might have ended their fixtures as leaders but look like they will be overtaken. All the goals came in the second half as they beat Rise Park 4-1, Carla Burton, Becky Shaw, Lauren Turner and Laura Watton with one each. Both Nettleham and Peterborough Northern Star are three points behind, with two and three games to go respectively. PNS sunk Mansfield Hosiery Mills 7-0, Cassie Steward with a hat-trick and a Vicky Gallagher brace including a double drag-back turn. Kettering Town are ninth after a 5-1 victory at Arnold Town. 1 NORTH – Woodlands won the title in midweek, 4-2 at Market Warsop, with a hat-trick from the prolific Jody Scott. She then netted eight of the twelve goals scored against Teversal on Sunday. Lincoln Moorlands Railway secured a top three finish with the 3-1 win at Arnold Town DS, while Jade Baker struck five times in Sleaford Town’s 9-0 win at Clifton. 1 SOUTH – Northampton Town leapfrogged Oadby & Wigston Dynamo into second on goal-difference after sending them to a 3-0 defeat. 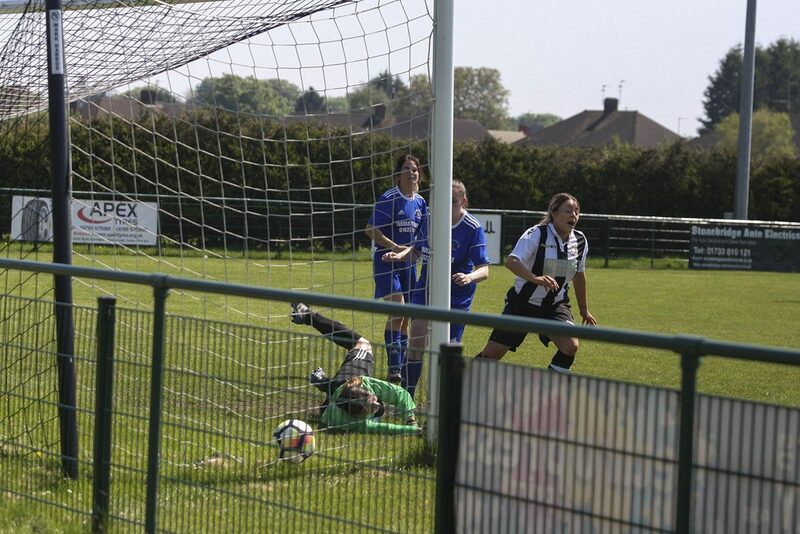 Thrapston Town ran out 8-2 victors at Corby Town, Alex bartlett, Briony Cox and Emma Robinson all scoring twice. PREMIER – London Kent Football United finished third after their 3-1 win at Aylesford. GREATER LONDON PREMIER – Victoire moved from tenth to eight on goal-difference with a 2-1 win at Hemel Hempstead Town, where Josie Elliott and Sherelle Walters scored for the Surrey side. Hampstead and Hackney drew a blank as the division’s matches were completed. PREMIER – Hartlepool United’s slender title hopes were extinguished when losing the led at home to Farsley Celtic, who went away 2-1 winners. York City walloped Wallsend BC 11-1, Lucy Lendill with a five-goal haul and Megan Bramham a treble. Leaders Norton & Stockton host second-placed Durham Cestria on Tuesday and a home win would all but seal the championship for the Ancients. 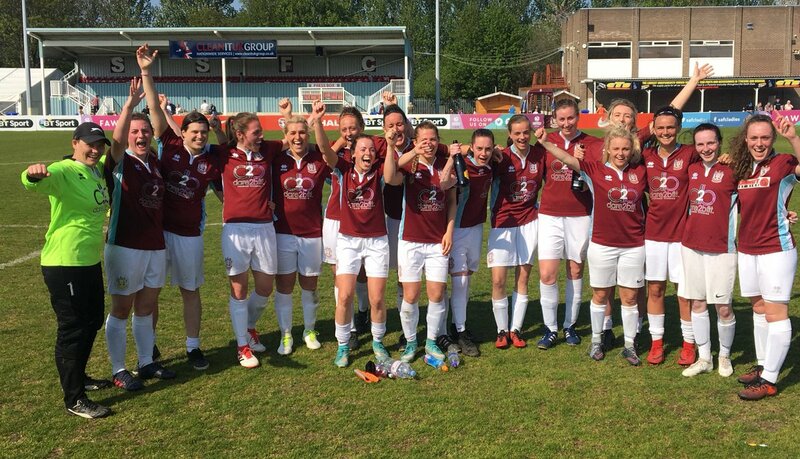 1 NORTH – South Shields won the division with a game to spare, following a 2-1 victory against Consett. They could have afforded a loss anyway, as second-placed Boro Rangers finished 1-1 with Boldon CA Villa. PREMIER – Burnley’s 2-0 midweek win at title rivals Stockport County all but ensured the Clarets would be soon drinking champagne. Stockport must win at Blackpool on Wednesday to stay in contention but even that being the case, Burnley finish their fixtures next Sunday with a double-header against basement side CMB. Elsewhere, Accrington Sports beat MSB Woolton 2-0. 1 NORTH – Penrith won at Bury in the week to end their hosts’ hopes and then edged Burscough Dynamo 3-2 in their final game to win promotion. Cammell Laird took second position after a 2-1 result at third-placed Carlisle United. 1 SOUTH – Altrincham’s last game was a fine 4-1 win at runners-up West Didsbury & Chorlton, even though the home side opened the scoring. The Argyle Sports Cup and Plate finals on Sunday 13th May are now at Runcorn Linnets FC, where FC United play Stockport and Liverpool Feds Reserves take on Warrington Wolverines. 1 SOUTHERN – AFC Bournemouth have one hand on the trophy after hitting Eastleigh 6-1, which included a second-half Chloe Tape hat-trick and two from Rosie Eden. The Cherries now need only avoid defeat at Winchester City Flyers Reserves next weekend in order to secure top spot. 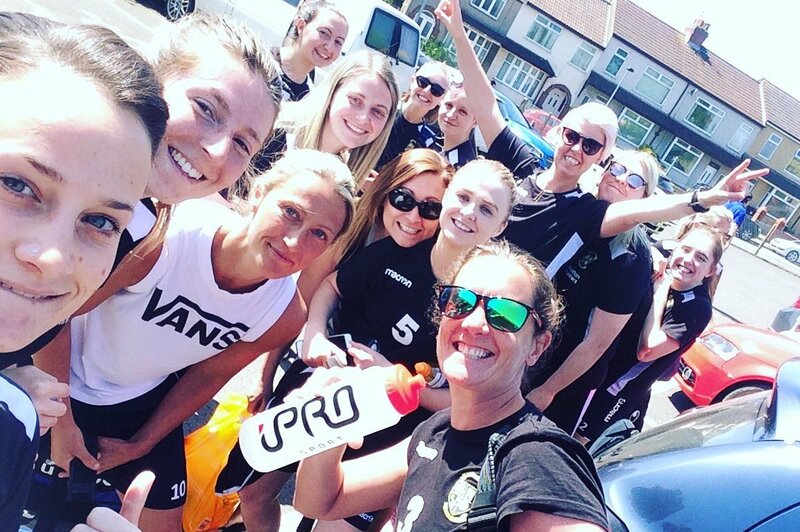 PREMIER – Buckland Athletic beat title rivals Marine Academy Plymouth 3-0 in midweek and were then champions with a 7-1 win at AEK Boco on Sunday, where Amber Coates got three, Laura Gough and Abigail Meyer two apiece. Torquay United are second after a 5-1 success at Bishops Lydeard, Sian Chapman with two. Exeter City came from 2-1 down to win 3-2 at Middlezoy Rovers with a Jana Richards hat-trick, to move above their hosts into fourth. 1 EASTERN – Swindon Town DS are 3 points short of leaders Portishead witha game left each after they surrendered a three-goal lead to them but grabbed the winner through Kathryn Bach. However, Wootton Bassett Town remain in the strongest position, having games in hand. An Ellison Roberts treble saw Team Mendip go fourth with a 3-2 result over Oldland Abbotonians. Diana Toth came off the bench to score three times in Cheltenham Town DS’s 6-1 defeat of FC Chippenham, which pushed them in front of their visitors to eighth place. 1 WESTERN – Callington Town took a step towards the title with a 5-1 result against Exeter & Tedburn Rangers, Lucy Bounsall with a couple, while Bideford got both goals at Activate. PREMIER – Leafield Athletic kept pole position with a 4-1 win over Crusaders (Georgia Godfrey getting two) but Bedworth United continue to threaten after sending Knowle to a 6-1 defeat. The top two clash at Leafield on Sunday, Bedworth being 2 points behind from a game less. 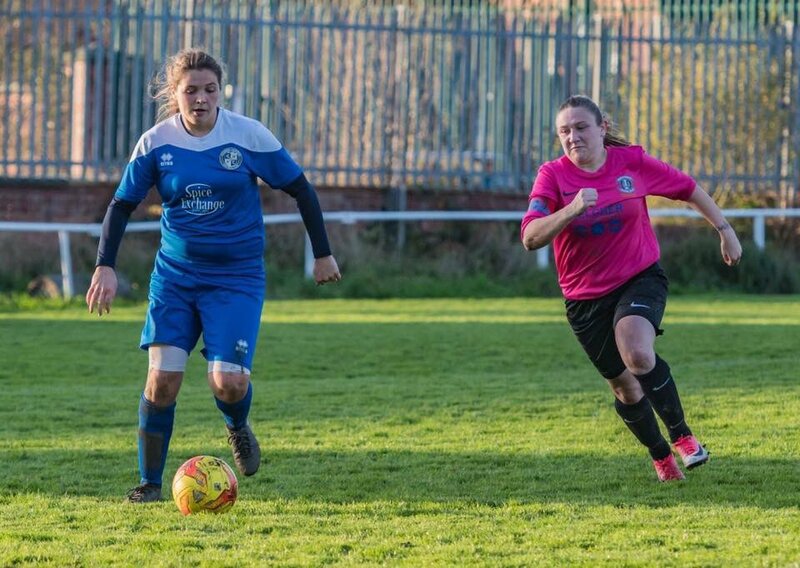 1 NORTH – Leek Town and Goldenhill Wanderers stayed in pursuit of top of the table Sutton Coldfield Town, the former winning 3-2 at Florence with a last minute goal, the latter coming through 4-3 at Wyrley where Holly Ellison struck twice. 1 SOUTH – Gornal’s position in first looks more than a little shaky after a 3-2 final-game loss at third-placed Coventry Phoenix. Both they and Redditch can overhaul the leaders, United having won 6-1 at Coventry Development with the help of three goals from Ellie Gerhold.